Raw tar from coking contains not only water with dissolved ammonia, hydrogen sulphide and aluminium chloride but also coal dust. Cleaning and processing of tar largely separates out the water and solids. The purity of tar has a decisive effect on its market value. During processing of tar, decanters separate the solid impurities out of the raw tar. The cleaned tar contains less than 0.3% quinolin and insoluble solid particles larger than 50 μm. The separated solid has a total dry solids of approx. 33 – 40% and its consistency is between clumpy and almost solid. 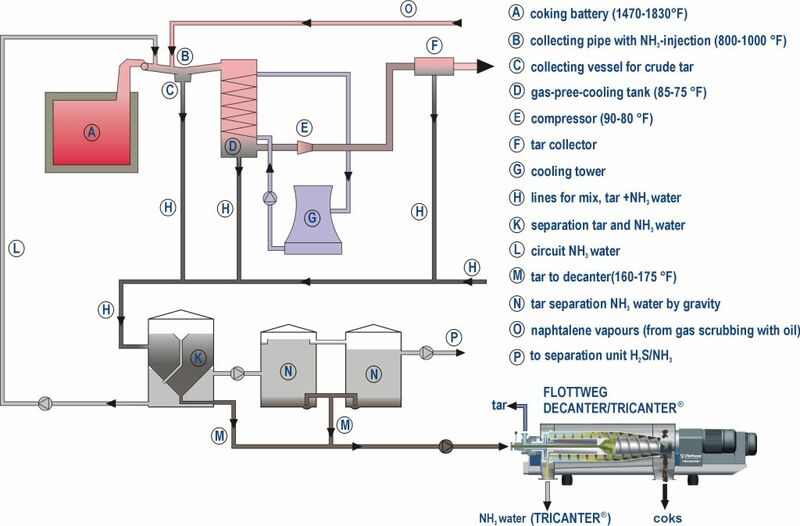 During tar cleaning, Flottweg Tricanter® machines simultaneously separate out the ammonia water and solid particles. The cleaned tar has a water content of less than two percent. The objective of cleaning and processing tar in coking plants is clear: increasing the value of the tar through higher purity and extending the cleaning intervals of the storage tanks. This can be achieved smoothly and efficiently by using decanters and Tricanter® machines. Lower costs for maintenance and servicing due to lower wear on system components such as pumps, valves, etc. Flottweg has been developing and producing centrifuges for 60 years, and is one of the world’s leading decanter manufacturers. No other manufacturer of decanter centrifuges has so much experience in tar cleaning as we do. Flottweg also produces mobile separation systems and skids that can be used worldwide. The mobile systems give you increased flexibility and enable you to respond quickly to changing deployments. It goes without saying that our global 24-hour service is also at your disposal for mobile separation systems and skids. Optimum protection against wear is decisive for centrifuges used in coking plants. Our decanters are protected against wear by means of carbide plating, tungsten carbide and ceramic paste as well as being equipped with bushes made from silicon carbide ceramics for special applications. The service life of the wear protection in our centrifuges for tar cleaning is generally in excess of 15,000 operating hours. The Flottweg Simp-Drive® regulates the differential speed according to the scroll torque. The centrifuge automatically adjusts to different load statuses and concentrates the separated solid to achieve the maximum total dry solids. We supply complete centrifuge plants specifically for use in coking plants. These consists of a Flottweg decanter and Tricanter® machine as well as the control unit, explosion-proof switchboard, automatic inflow regulation, mass flow measurement, inerting system, steam flushing and preheating monitoring as well as flushing devices. This also applies to mobile separation systems and skids. Flottweg sets up all the plants and takes them into operation.